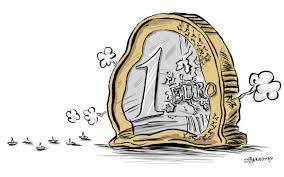 To paraphrase Winston Churchill: the Greek bailout is not the end of the euro crisis. It is not even the beginning of the end. But it is, perhaps, the end of the beginning. This crisis is not going to go away. It will be with us for several more years. And it is going to get ugly when the costs of the neoliberal austerity policies forced upon them are fully realized by the very angry citizens of southern Europe. The plan is to force them—in the classical neoliberal “structural adjustment” style usually reserved for financially colonized developing countries—to pay the price of failed EU policy and financial speculation, in practice a wage freeze, welfare cuts, privatization of public facilities and high unemployment as far into the future as the eye can see. The whole structure of the euro was a design failure from the beginning, as this author and several other economists pointed out over ten years ago. The euro project was a top-down effort of European bureaucrats and politicians to establish through the back door what was not possible through the front door—a United States of Europe, which they knew would have been rejected by EU citizens if they were ever asked their opinion. They hoped that the formation of a single currency zone: would be the first step toward a “eurostate”, but they neglected the fact that there was no central government and it was made up of members with an enormous disparity in culture and fiscal discipline. With no possibility to issue their own currencies, or to devalue their currency to compensate for higher inflation rates, and no procedure for exiting the euro, it was only a question of time before a full-fledged crisis erupted as the southern members’ economies became uncompetitive in a vicious circle of inflation, trade and budget deficits, enormous debts and high unemployment. The recently adopted EU Financial Pact’s insistence on debt reduction and austerity at a time of economic downturn is a throwback to 19th century thinking—to the era of the gold standard—before John Maynard Keynes. It did not work then and it will not work now. Government debt reduction is a growth killer par excellence, almost guaranteed to create a depression. The United States, for example, has experienced six periods of depression: 1819, 1837, 1857, 1873, 1893, and 1929. In every single case, the depression was preceded by a significant reduction of government debt, which removed money from the economy at a time when what was needed was more money to create jobs and stimulate demand. It took the genius of Keynes to realize that active countercyclical intervention by government was the solution to the inevitable swings in the business cycle. But to create new jobs with government spending at a time when the there is no demand for new investment by industry, and the private sector is overburdened with debt, requires a central government that is not revenue constrained, i.e. it can spend its own currency and can always pay debts denominated in that currency.